Well, this is the end for 2018. Four San Gabriel Valley boys teams and four girls teams will compete in Saturday’s California State Cross Country Championships on the 5000m course at Woodward Park in Fresno. Five of the eight teams return from 2017, including two champs. The Claremont and Flintridge Prep girls are multi-year champs in Div. II and V, respectively. The Wolfpack, CIF-SS Div 2 champs, are favored to make it three in a row while Prep will face a big challenge to their four-year streak. Sydney Hwang led CHS with an 11th place finish last year, and she’s been joined, and now surpassed up front by frosh Maddie Coles, who won last week’s CIF-SS Champs. Prep will be led by senior Haley Allen, 6th last week and 8th here last year. The boys teams from CHS and FP also return from 2017 meet, where they were both 4th. Mayfield, 4th here last year, are back for the fifth year in a row, and the ninth time in ten years. Soph Audrey Suarez was 2nd in years meet and 2nd last week at CIF. 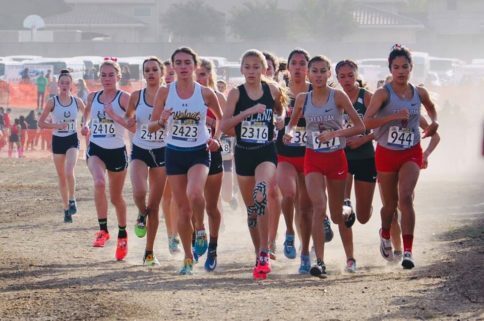 The Walnut girls, led by seniors Chloe and Emma Arriaga have finally advanced after many near misses, as have the South Pasadena boys, who took advantage of a move to Div. IV. The California boys return after missing 2017 – they’ve advanced four the five last years. Six boys and five girls have advanced individually this year. All six of the boys will be making their state meet debuts – Noah Hibbard (Sr, Arroyo) in Div. II, Devin Hightower (Sr, South Hills) & Eduardo De Paz (Jr, Baldwin Park) in Div. III, and Owen Serricchio (Sr, La Cañada), Nathan Vallejo (Sr, Southlands Christian) & Nathaniel Estrada (Jr, Pioneer). The four of the five girls competed here in 2017. Joyce Wu (Sr, Arcadia) ran with here team and was 23rd in Div. 1. Olivia Paez (Sr, Bishop Amat) was 24th and Ellaney Matarese (So, La Cañada) 56th in Div. IV. Lily Miller (So, Webb) advanced on her own and finished 22nd in Div V. Lauren Nettels (Jr, Flintridge Sacred Heart) will make her State meet debut. Previous PostSGV Boys Final Team Rankings: Claremont All Year LongNext PostState Meet: Audrey and Claremont are Champs!